I approached Burn in some trepidation. It’s the final book of the ‘Pure’ trilogy. I found Book 1, Pure, to be a dark, brooding dystopia with strong themes, and more meat than your average YA post-apocalypse dinner. Book 2, Fuse, however, I found less satisfactory. The characterisation was strong, but the story was more generic, less interesting. So which way would Burn take things, downwards, or upwards towards greatness? 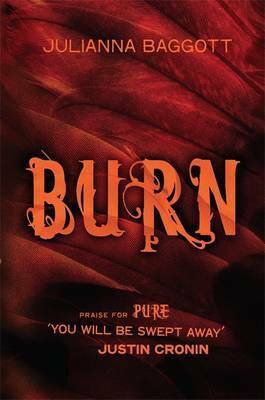 If you haven’t read the first two books, it goes without saying you should stop reading at the end of this sentence, but do look Pure up; Burn elevates the series to heady heights. Whilst Burn picks up right where Fuse leaves off, there is an almost immediate change in tone. We’re mostly inside the dome now and there is an urgency about the plot. The first two books were essentially quest stories. This is more like a ticking bomb with time running out. The burning question in the book is – How can Partridge move out of the shadow of his father? I said in my review of Fuse, that the portrayal of Ellery Willux was heavy handed. He was almost too perfect a villain, too calculating and accurate in his assessments to be fully credible. Killing him made the man. Alive, Willux Snr left no room for doubt. He was a maniac with absolute control and this diminished the story. There was never a sense that, actually, he might have a point (contrast this with Patrick Ness and Mayor Prentice, a man the reader is programmed to hate, and then suddenly, there are countless shades of grey and we’re not sure what to believe). Once he’s dead, and with further revleations about the world after the detonations, fresh doubts are sown. Partridge is now leader of the Dome, in name at least. He is terrified of becoming his father, but much of what Ellery did kept the Dome safe. How can he differentiate the tyrant from the protector? This dichotomy is at the heart of the novel. It’s cleverly played out, especially with the introduction of Forsteed, the disgruntled number two whom Partridge has leapfrogged over. Partridge wants to help his friends on the outside but he comes to realise this will come with a terrible price for those inside. Is he prepared to pay that price, and even if he is, should he? There is also the world beyond the dome, and it wants in. Pressia, El Capitan and Bradwell, all with varying degrees of rancour, want to see the dome brought low, but do they trust Partridge to do it? Much mileage is gained from it being impossible to find out what’s happening inside the dome. When Partridge’s plans go awry, not everybody is prepared to give him the benefit of the doubt, with potentially disastrous consequences. Baggott manipulates her readers well. We’re omniscient, so can see where the misconceptions occur, and only groan when well-intentioned actions send events spiralling towards disaster. In her opening two novels Baggott has collected herself some fine cards, and in Burn she plays them more or less to perfection. The novel boils to whether there will be a supreme victor, inside or outside, or whether perhaps the two can live in harmony. Not many people think so. There is a fascinating examination of whether it is possible to live without your past. If you could erase the worst parts of your life, would you still be you? Baggott’s answer plays a pivotal role in the denouement of her novel. Many Thanks to the team at Headline for sending me the final book in this trilogy.